Just had this delivered this week. 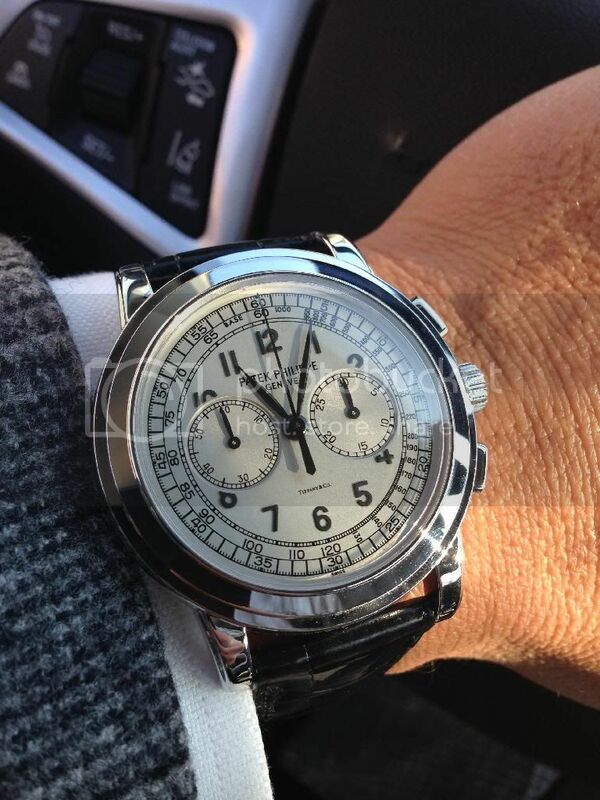 Back in 2003-2004, I had just started to get into watches, didn't know anything about anything but knew I liked the Patek 5070g So, I called around to literally every AD in America and would ask " Hi, do you have a 5070g ?" The polite ones would say no, and the not so polite would laugh. Then sometime in 2004 I walked into an AD in Virginia and asked, Do you have..... and they said yes ! One came in today. List price as around 32K and I could have bought it for around 27 or so. But I couldn't afford it then, so I left it. I (pretty much) regretted it everyday since. Since then I have bought more expensive watches, and always seemed to pass on the 5070. Maybe because I didn't want to pay double the price I could have had it for. But last week my AD called and said they just got a LNIB with all papers, etc., BUT this had a "Tiffany" stamp. I actually wasn't sure about it because of the co-branding but a little research and some sage advice from friends and I couldn't let this one go too. Probably the most satisfying watch purchase in my collection.